The traditional story of the south: barns, fields, dilapidated gas stations, grandparents, a keen sense of rhythm, and a pronounced attention to the detail of these things. Family stories filled with fairly controlled amounts of emotion and longing and romanticism. 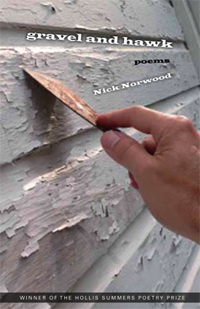 Qualities like these flare in Nick Norwood’s latest collection, Gravel and Hawk, out from Ohio University Press. It’s a book of family and most certainly of place. The moving lens of the speaker hovers over these components for various amounts of time and in various patterns, chopping up the focus so that the southern tale might not get too long-winded. Norwood uses his focus on the South to expose the relationship between people and place throughout the collection. At least, the opportunities are there and some exposure is developed. He constructs a short sequence near the middle of the book simply called “Buildings,” in which various buildings around this hometown are examined in various lights. Some focus on the items lying around the place while others describe past events on the property, memories and injuries. I’m reminded right away during the first of these poems, called “Filling Station,” of — obviously — the Elizabeth Bishop poem of the same name. While Norwood’s gas station has some beautiful imagery, such as the opening line “The dirt driveway is potbelly black, / jeweled with bottle caps and broken glass,” the poem doesn’t do what Bishop’s does so well: connect the place with its people. And in a collection so focused on the people and family of the South, it seems to me more importance should be applied to this connection. Later in the same sequence, a poem titled “Field Shed” does accomplish this connection, and it does it well. Here the farmer walks among the many still and silent dangers sitting in the shed. “He walks in a vapor, drags it like a mean spirit / a half step behind. Where he stops it hovers. / His father’s harness hangs on the wall.” The man now has a past, a father, has concerns and threats, “mean spirits,” and all these things that a place can and should bring to its residents. Finally we have connections. Finally we have the South. walls hung with bulbs bulging burlap sacks. Again, clearly, an honest attempt at enjoyable and perhaps folksy sound-work is at hand here, but it seems that it’s trying too hard to accomplish all that. The damn “ing” sound is much too much for my ears, though I’ll admit the italicized sound-effects are dead-on accurate. It’s moments like these where I find the struggle of balancing poetic soundplay with some type of folksy southern story to be exposing itself like a bone breaking through flesh, where just seeing it lets your gut know that something is wrong. But, again, I can appreciate this type of play in its brevity and for its strengths. The language within the book does lend itself to some cohesiveness. As I read on, I could always tell it’s the same voice producing these poems, but the language is often varied just enough in each poem where it doesn’t get too droll or dull as it moves forward. Subtle things like listing in a poem or forming a set of instructions help with this. But it’s not too obvious as you’re reading it because the attitude and descriptive qualities are fairly consistent throughout. As a book with one solid theme, the mix between consistency and variety is important. To keep this constant theme from becoming too static, Norwood employs a few sets of arcs, including the “Buildings” sequence mentioned earlier. He later begins a very similar exploration of buildings in a short set, and then, unannounced and very subtly, a cow — that’s right — sequence occurs that sheds an honest, real light on the human-animal connection that inevitably happens on a farm, and explores how that revolves around the lifespan of each creature. this real power to the collection, connecting the poems much closer to the poet, and bringing the reader along in the memory-exploring. C.J. Opperthauser is a Michigander living and teaching in Ohio. His poems have been published in such venues as Midwestern Gothic and The Cleveland Review, and his reviews in Coldfront and Fiction Southeast, among others. He likes to run and fish, and blogs at http://thicketsandthings.tumblr.com.